At the end of a long, bloody revolution, a land prevailed where citizenry chose its leaders not from divine right or kings, but from ordinary citizens. For over 14 years, Wounded Warrior Project® (WWP) has connected, served, and empowered our nation’s wounded veterans through free programs and services. For even longer, the men and women of the American military have defended our nation – and the Constitution that governs our republic. The early history of America is one of sacrifice and defiance, built upon a Declaration of Independence stating “that all men are created equal, that they are endowed by their Creator with certain unalienable Rights, that among these are Life, Liberty, and the pursuit of Happiness.” What led to that declaration, however, was more than just words, debate, and acts of defiance against the British government. It was a long and complicated road of historical resentment, build-up, intrigue, and political conflicts that ultimately spilled over and paved the way for a violent revolution. At the end of it, a land prevailed where citizenry chose its leaders not from divine right or kings, but from ordinary citizens. Below is a timeline of the key catalysts on the American colonies’ road to revolution. 10 February: The Seven Years’ War ends with the signing of the Treaty of Paris. As a result, France gives up control of all mainland North American territories, except New Orleans. Britain gains all territory east of the Mississippi River, with Spain keeping territory west of the Mississippi, having exchanged East and West Florida for Cuba. 7 October: In the Proclamation of 1763, King George III announces a prohibition on settlement west of the Appalachian Mountains due to the increasing costs of defending the colonies. This intervention hindering ability to govern lands to the west offended the residents of the 13 colonies. 5 April: The British government drops the taxes on molasses (both to reduce smuggling and encourage production of British rum) and places a tax on foreign wine, colonial exports of iron, and other goods that had to pass through British customs. A Vice-Admiralty Court is established in Halifax, Nova Scotia, to hear smuggling cases without jury and with the presumption of guilt, leading to widespread protest. The Sugar Act would be the first of many decisions made by the British government to finance the governance of the British Colonies. 22 March: British Parliament passes the Stamp Act, requiring all legal documents, newspapers, and pamphlets to use watermarked or stamped paper to raise revenues. 15 May: British Parliament passes the Quartering Act, requiring colonial legislatures and assemblies to pay for supplies to British garrisons. The New York assembly refuses to comply. 30 May: The Virginian assembly refuses to comply with the Stamp Act, in a series of resolutions known as the Virginia Resolves. 7-25 October: Representatives from nine of the 13 colonies declare the Stamp Act unconstitutional because it taxed them without consent. 18 March: British Parliament finalizes the repeal of the Stamp Act but declares it still has the right to tax the colonies at will. 1 October: British forces arrive in the Boston harbor as a response to the growing political unrest. 5 March: Boston residents begin harassing soldiers guarding the customs house. In the fray, a soldier is knocked down by a snowball and discharges his musket, sparking gunfire into the crowd and killing five civilians. 10 June: The British revenue ship Gaspee runs aground near Providence, Rhode Island. Locals angered by the enforcement of trade legislation burn the ship. 10 May: To support the failing East India Company, British Parliament exempts its tea from import tariffs and allows the company to sell its tea directly to the colonies. Colonial residents are outraged at the Tea Acts, which they see as an indirect tax subsidizing a British company. 5 July: Massachusetts Governor Thomas Hutchinson publishes letters calling for a “great restraint of natural liberty,” sparking concerns that a planned British clamp-down on their freedoms was imminent. 16 December: Angered by the Tea Acts, American colonials disguise themselves as Mohawk Indians, raid a ship owned by the East India Company, and dump £9,000 worth of tea into the Boston harbor. May to June: British Parliament introduces four measures known as the Intolerable Acts, stripping the rights of self-government and judicial independence from the commonwealth of Massachusetts, in retaliation for the Boston Tea Party. Colonial residents respond with a boycott of British goods. September to October: Colonial delegates from across the 13 colonies meet to begin organized opposition to the Intolerable Acts. 19 April: British soldiers attempt to seize the weaponry of the residents of Lexington and Concord. Colonial citizens, who had been warned of the attack by Paul Revere, engage the British troops and drive them back, marking the first engagements of the Revolutionary War. 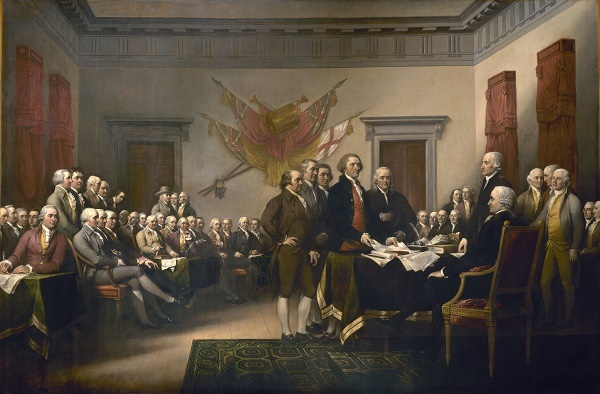 14 June: The Continental Army is formed. 16 June: The Continental Congress appoints George Washington as commander-in-chief of the Continental Army. 17 June: The Battle of Bunker Hill takes place, marking the first major battle of the War of Independence. British General Sir William Howe defeats William Prescott's Colonial forces. There are 1,054 British casualties and 367 American casualties. 5 July: Congress issues a proposal to the British Royal Court asking for recognition of American rights and the end of the Intolerable Acts in exchange for a cease fire. King George III rejects the proposal and declares the colonies to be in open rebellion. October 13: The Continental Navy is formed. 2 May: France begins providing covert aid to the American revolutionaries, mainly in the form of gunpowder and weapons, as revenge against Britain for its defeat in the Seven Years’ War. 4 July: The Continental Congress, in a vote of 12 for and 1 obtaining, passes the Lee Resolution, issuing a Declaration of Independence, stating: “When in the Course of human events, it becomes necessary for one people to dissolve the political bands which have connected them with another, and to assume among the powers of the earth, the separate and equal station to which the Laws of Nature and of Nature's God entitle them, a decent respect to the opinions of mankind requires that they should declare the causes which impel them to the separation.